NOAA nautical charts has been avail- able in digital raster form since 1995. These high quality, full color, geo-refer- enced images of NOAA's paper charts are made for use in computer-based nav- igation systems and work with GPS or other electronic positioning systems. They are produced jointly by NOAA and Maptech, Inc. under a cooperative research and development agreement (CRADA). 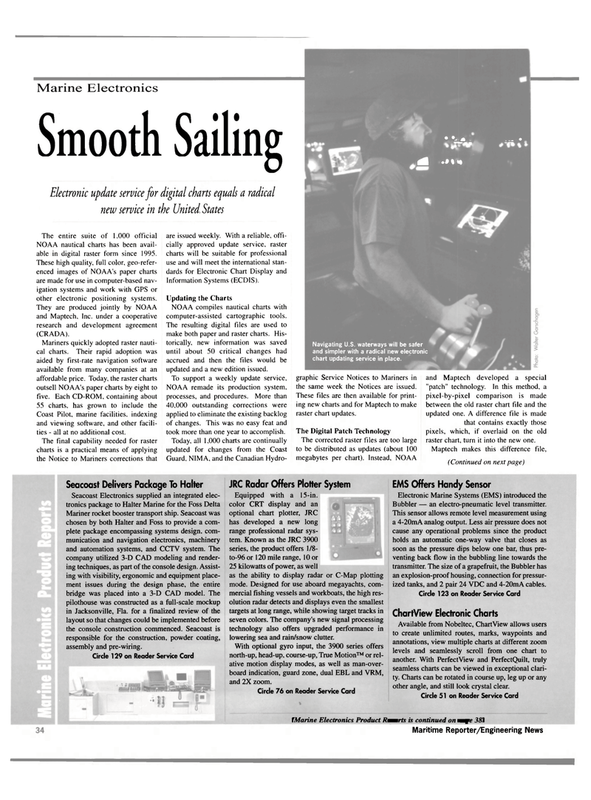 Coast Pilot, marine facilities, indexing and viewing software, and other facili- ties - all at no additional cost. NOAA compiles nautical charts with computer-assisted cartographic tools. The resulting digital files are used to make both paper and raster charts. His- torically, new information was saved until about 50 critical changes had accrued and then the files would be updated and a new edition issued. NOAA remade its production system, processes, and procedures. More than 40,000 outstanding corrections were applied to eliminate the existing backlog of changes. This was no easy feat and took more than one year to accomplish. Navigating U.S. waterways will be safer and simpler with a radical new electronic chart updating service in place. graphic Service Notices to Mariners in the same week the Notices are issued. These files are then available for print- ing new charts and for Maptech to make raster chart updates. The corrected raster files are too large to be distributed as updates (about 100 megabytes per chart). Instead, NOAA and Maptech developed a special "patch" technology. In this method, a pixel-by-pixel comparison is made between the old raster chart file and the updated one. A difference file is made that contains exactly those pixels, which, if overlaid on the old raster chart, turn it into the new one. Mariner rocket booster transport ship. Seacoast was chosen by both Halter and Foss to provide a com- plete package encompassing systems design, com- munication and navigation electronics, machinery and automation systems, and CCTV system. The company utilized 3-D CAD modeling and render- ing techniques, as part of the console design. Assist- ing with visibility, ergonomic and equipment place- ment issues during the design phase, the entire bridge was placed into a 3-D CAD model. The pilothouse was constructed as a full-scale mockup in Jacksonville, Fla. for a finalized review of the layout so that changes could be implemented before the console construction commenced. Seacoast is responsible for the construction, powder coating, assembly and pre-wiring. Equipped with a 15-in. color CRT display and an optional chart plotter, JRC has developed a new long range professional radar sys- tem. Known as the JRC 3900 series, the product offers 1/8- to-96 or 120 mile range, 10 or 25 kilowatts of power, as well as the ability to display radar or C-Map plotting mode. Designed for use aboard megayachts, com- mercial fishing vessels and workboats, the high res- olution radar detects and displays even the smallest targets at long range, while showing target tracks in seven colors. The company's new signal processing technology also offers upgraded performance in lowering sea and rain/snow clutter. With optional gyro input, the 3900 series offers north-up, head-up. course-up, True Motion™ or rel- ative motion display modes, as well as man-over- board indication, guard zone, dual EBL and VRM, and 2X zoom. Bubbler — an electro-pneumatic level transmitter. This sensor allows remote level measurement using a 4-20mA analog output. Less air pressure does not cause any operational problems since the product holds an automatic one-way valve that closes as soon as the pressure dips below one bar, thus pre- venting back flow in the bubbling line towards the transmitter. The size of a grapefruit, the Bubbler has an explosion-proof housing, connection for pressur- ized tanks, and 2 pair 24 VDC and 4-20mA cables. Available from Nobeltec, ChartView allows users to create unlimited routes, marks, waypoints and annotations, view multiple charts at different zoom levels and seamlessly scroll from one chart to another. With PerfectView and PerfectQuilt, truly seamless charts can be viewed in exceptional clari- ty. Charts can be rotated in course up, leg up or any other angle, and still look crystal clear.